Maximize equipment life and profitability with Premium Metal-Guard® VCI Film. Our superior corrosion inhibitor formulation is blended throughout our VCI films to provide an invisible, protective barrier that prevents corrosion-causing contaminants from depositing directly on metal surfaces. 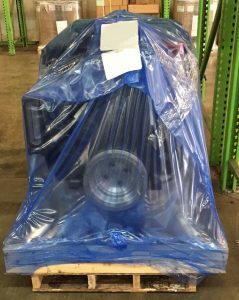 Premium Metal-Guard® VCI Film protective packaging keeps your machinery and metal parts free of corrosion during all stages of packaging, shipping and storage. Contact us for more details about how this transparent, versatile, durable VCI film can provide corrosion protection on all of your valuable multi-metal components.